As Favourite Hong Kong Movies begins tomorrow, I just wanted to take a moment to thank everyone who has contributed their list so far. I know from my own experience just what a difficult task it is to come up with a list, to actually pin yourself down and make a decision as much on what to leave out as what to put in. The pain and agony some of the contributors have gone through in order to whittle down the hundreds of movies they could have chosen makes me appreciate the effort they have gone to even more. The selection approach has varied from person to person, and it's particularly difficult to separate what is a favourite from which films you think are the "best" ones. For what it's worth I chose the films I've seen the most, their can surely be no better way of determining what your favourites are? With still around 10 lists still to come in, I'm setting a final entry date of the 18th of August, so please everybody, make the hard choices and get those lists in. 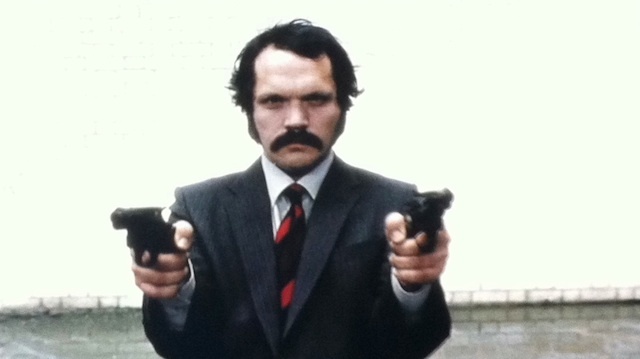 A Gun For George is a short film (17 minutes) from 2011, it was shown on UK channel Film Four in the early hours during May this year as part of a season of revenge films. I recorded it, knowing absolutely nothing about it other than the description on the Sky info "Short, violent crime thriller about a pulp fiction writer who decides to avenge his brother's death at the hands of gangsters"
I completely forgot about it until a routine clearing of the sky plus box. On starting the film I was immediately grabbed by the director credit, Matthew Holness. 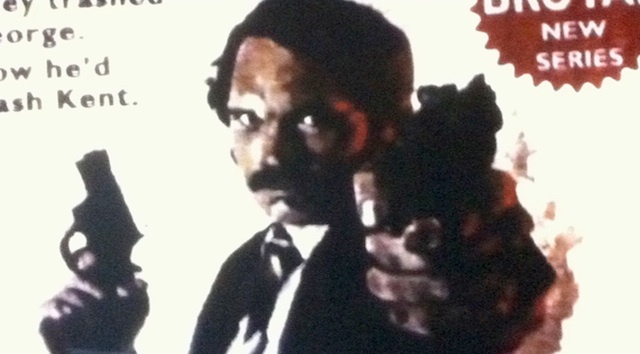 Holness was the brains behind the excellent eighties horror spoof Garth Marenghi's Dark Place. My expectations for A Gun For George shifted towards comedy, and while it's true that it is extremely funny, there is more to it than just that. Terry Finch (Matthew Holness), is the author of "The Reprisalizer" series of books, who, having lost his brother George to the gangster scum invading suburban Kent, turns vigilante in his attempts to avenge his brother's death. Dealing out testicular violence (he has a "disquieting ball fixation" according to his publisher) to those who deserve it with extreme prejudice. In between he has to deal with his publisher and the local library to get his prose to the The Reprisalizer's rabid fan base. Like Dark Place, A Gun For George is built around the little details. For a 17 minute film, Finch's world is remarkably rich and rewarding, both in the real world and in his Walter Mitty style fantasy sequences, in which he doles out justice with his twin snub nosed revolvers. Functioning as both a homage to and a spoof of the kind of lurid pulp novels, that, as a child I could only stare at in wonder, desperate to know what further treasures were behind the first book on the spinning rack. Where if I'd been caught by my Mother, I'd probably have got a slap just for looking at them, in the days where prices were measured in pence rather than pounds. The Reprisalizer books with titles like "I, The Fury", "I Right Wrong" and "The Hell I Will" and with taglines such as "They trashed George, now he'd trash Kent" and "Westgate On Sea was on fire, so was he" give the feel of being genuine novels, and if only they were, I'd be first in the queue for the full set! 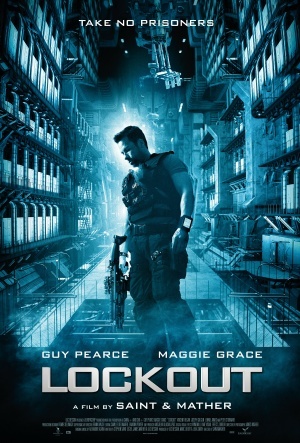 The film is endlessly quotable, as Finch speaks to anyone and everyone as The Reprisalizer, sounding like something out of the kind of 70's hard boiled cop shows as he warns a librarian who has upset him "I'll come for you woman and when I do, I'll re-arrange this library by genre". As funny as the film is, it also functions as a character study of a terribly sad fantasist, and is actually surprisingly touching and quite frightening by the end of the film. Rumours are that a feature length film featuring the characters is being prepped, it's unclear as to how that would pan out, would it be a Reprisalizer film or an expanded version of this short? Who knows, but A Gun For George makes for one hell of a trailer. Unfortunately the film appears to out of circulation at the moment, it was tweeted earlier in the year that it would be online soon but that doesn't appear to have happened as yet. It has been shown at various festivals and has been on Film Four at least twice. If you get a chance to see it, don't miss it. For more Holness has created a website based for The Reprisalizer, it hasn't been updated for a while but what is there is excellent stuff, check it out here. 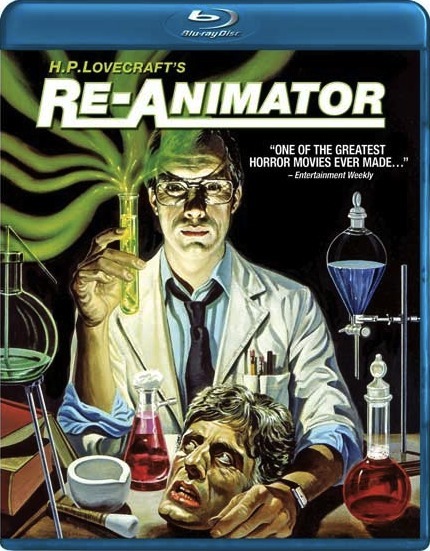 Image entertainment have announced the release of Stuart Gordon's Re-Animator on blu ray. This is a huge release for me, as Gordon's film is probably my favourite comedy horror ever. It surprises me it has taken so long to come to the high definition format. It was one of the films that sold me on the fledgling DVD format with a cracking release, even back then when the format was struggling. I expected we would have seen it in 1080p earlier, but never mind as it will arrive on September 4th. The blu ray is scheduled to include most of the extras from the most recent Anchor Bay dvd and a brand new transfer. The thing I'm looking forward to most about this release is hearing the Richard Band score in the lossless DTS format. I just hope they don't ruin the transfer! RRP is a very reasonable $17.98. Following on from this post, the next Milkyway Image laserdisc on the pick up list was The Longest Nite. I've already blogged extensively about this superb film, so I won't go on too much, but it's worth mentioning it almost made my list for the forthcoming Favourite Hong Kong Movies. Call me sentimental, but we will never see another format to rival laserdisc. 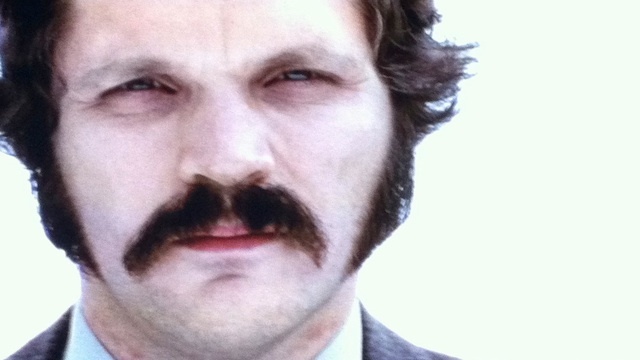 Obviously not in pure AV quality of course, but definitely in terms of desirability. Thank you to everyone who has contributed their list, and to let everyone know, the first one will be online from the 1st of August. To everyone else who wishes to take part, get those lists in as soon as possible, I can't wait to see what you have in store for us all! 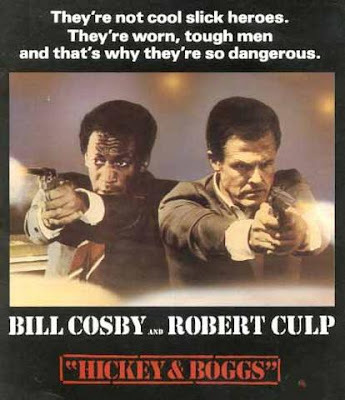 Robert Culp's only directorial credit Hickey and Boggs, made in 1972 was one of the first screenwriting credits of Walter Hill. Hill would go onto become a major director in his own right, being responsible for some of the most manly movies made in Hollywood. 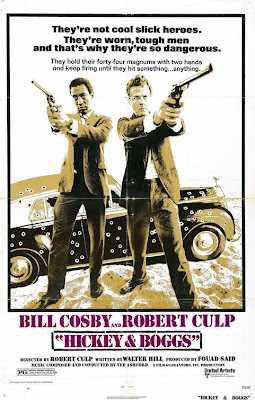 Culp, paired with his former I Spy co-star Bill Cosby as the two private investigators of the title, play against type to deliver a bleak tale of murder and avarice in the sunshine of L.A.
Detectives Hickey (Bill Cosby) and Boggs (Robert Culp) are hired to find a missing woman, for reasons unknown to them. and it isn't long before they find themselves up to their necks in trouble, thanks to the trail of corpses left in their wake. 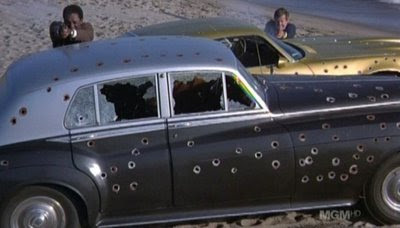 On one side they have the cops (including a young James Woods) wanting to know why the bodies seem to be following them, and on the other side, a gang of armed enforcers (including the great Bill Hickman), who are there where ever they go, and worse still they won't stop shooting at them. It all has to do with a case containing $400K of stolen cash from a bank job some years before. Hill's intricate screenplay offers only hints at what his future work would offer but the seeds are certainly there at least in terms of the fatalistic tone established by the film. Cosby is surprisingly good, adding real depth to his character without really having to do very much, a solid piece of work. 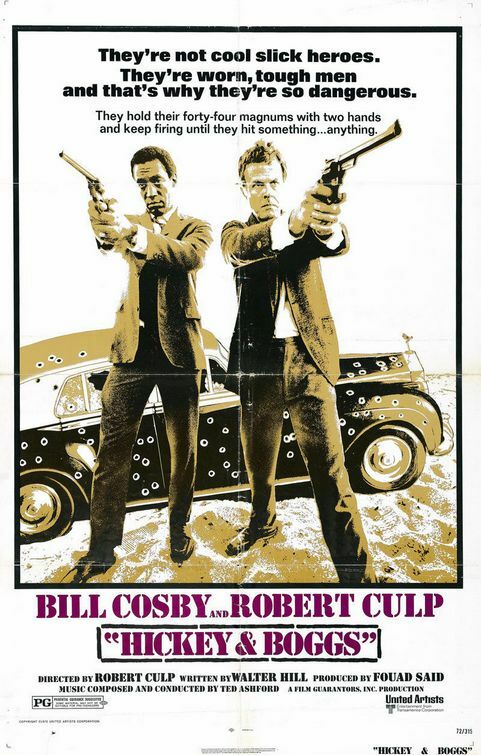 Culp's character has more quirk to it but as Cosby is so good, this works in the movies favour to keep the audience slightly off balance. More importantly, despite playing different types of characters to their previous work together, the chemistry between the two is priceless. Battered and bruised by their lives, and with little to show for them, they carry on regardless. The two jaded men don't even seem to be good friends, yet they need and rely on each other to keep going, without the constant goading between them, they surely would have just laid down. The job they do and the people they deal with only further enhance the deep sense of malaise. Culp's film is at once dryly amusing and downbeat, and also has a surprisingly subversive streak, giving an uneasy feel that permeates the entire movie. 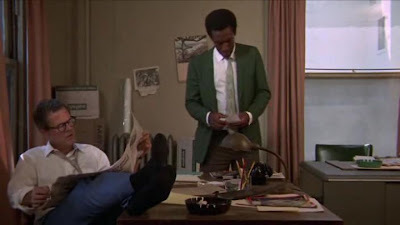 While the film has a few problems, particularly in the editing department that threaten to undo some good work in the otherwise well done action sequences, overall Hickey and Boggs is well worth your time. The story is nicely constructed and treats it's audience with respect, and the unusual character moments throughout the movie are a touch of genius and say more about the men than any amount of exposition could have. An unjustly neglected rough diamond of a film, Hickey and Boggs has been difficult to see for many years, with only a terrible dvd release in the US until MGM released it as part of their burn on demand dvdr program, honestly it deserves better. 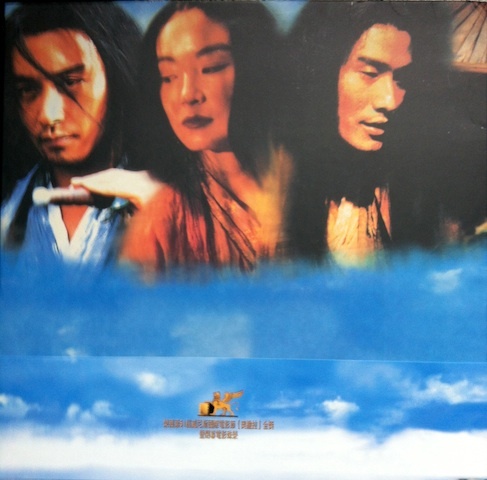 Hallelujah, today I finally had the dvd of Tsui Hark's All About Women delivered to me, you may think that is not particularly newsworthy and you'd probably be right. Some who have seen the film may say that I'd have been better off without it, and they may also be right, time will tell when I actually sit and watch the movie. As a sports fan, I'm a big believer in the theory of "bogey" teams, teams that always seem to beat your own team regardless of any other factors. All About Women was my bogey dvd, I have ordered this disc from various retailers a grand total of six times. Three times it has gone missing in the post, once my order was cancelled as unobtainable and the other the company just tried to rip me off. Now I've got it and the curse has been broken, I'm not sure I want to watch it anymore. Let's face it, it will either be a faulty disc or just a horribly disappointing film. Doh! 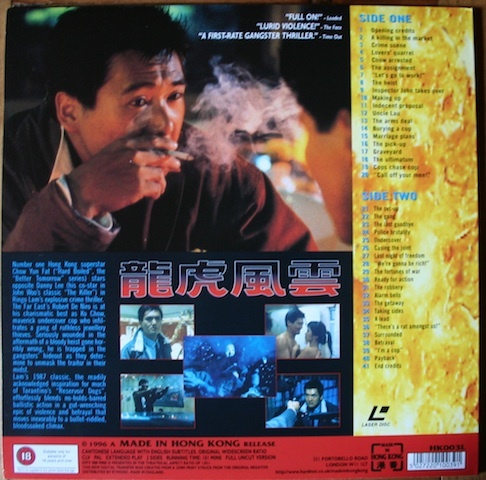 Inspired by listening to episode 128 of Podcast On Fire (a must listen to for HK fans), the second Tom On Fire edition, during which Ken Brorsson briefly waxes lyrical on the subject of laserdiscs, and the Hong Kong release of Wong Kar Wai's Ashes Of Time in particular. So I thought I'd dig it out and share it all with you, as far as laserdiscs go, it's a truly magnificent thing to behold, check it out! 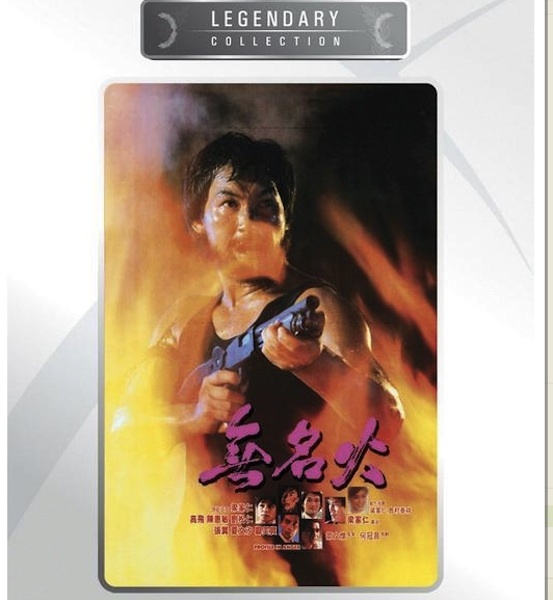 Forget Ashes Of Time Redux, this is where Wong Kar Wai's masterpiece is really at on home video! 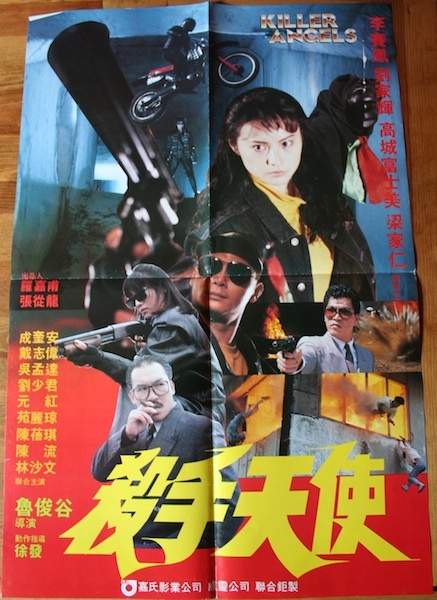 More of a crime and action focus this time around, although these being Hong Kong movies that doesn't prevent a wildly diverse variety of styles within the selection. 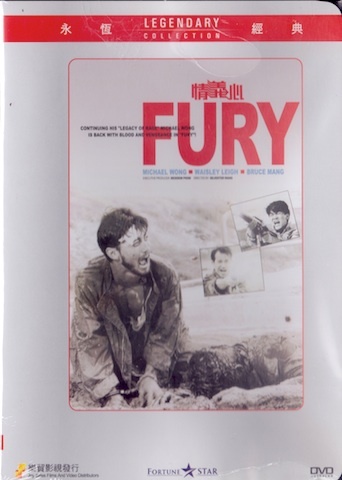 Wang Lung Wei's Fury, Michael Wong and W.L.W together, wow. Aang San's Fingers On Trigger. Chung Gwok Yan's Hired Guns, I'm really excited for this one. 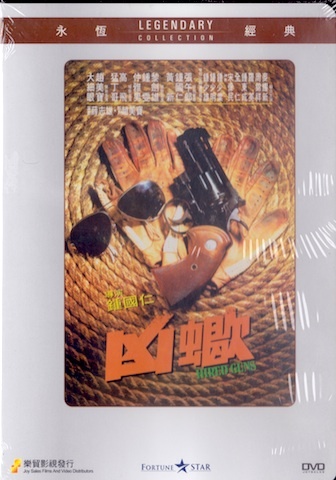 Yuen Chun Man and Cheng Siu Keung's Forbidden Arsenal, I've been interested to see this ever since finding out it was co-directed by Johnnie To's favourite cinematographer. A.K.A In The Line Of Duty 6. 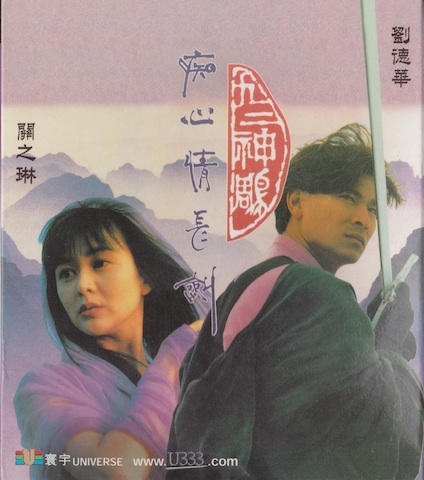 Two more Nam Nai Choi movies next, another crime/triad flick and then more of a fantasy action movie. Killer's Nocturne, how can anyone resist a movie with a boxing match between a kangaroo and a human? I know I can't! As if that wasn't enough, the film also features the awesome Pat Ha! Yuen Biao in The Peacock King. Finally two Vcds to finish, I searched for these on Dvd but couldn't find them anywhere so Vcd it had to be. Saviour Of The Soul and it's sequel. I recently reviewed the first film but have never seen the second one. Dumb, ridiculous, lazy and derivative, all words that comfortably describe the latest movie from the prolific Luc Besson stable of potential action franchises. 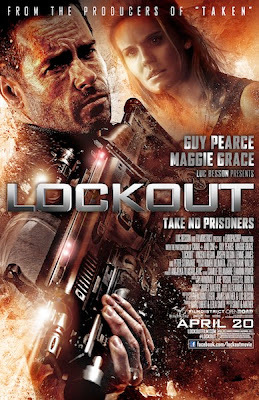 Despite this, Lockout has an ace up it's sleeve in the form of leading man Guy Pearce, who as secret service operative Snow delivers one of the more enjoyable action heroes for quite sometime. Equal parts Snake Plissken and John McLane, Snow is as copycat as they come, yet I still found him immensely enjoyable and the highlight of first time directing duo James Mather and Stephen St.Leger's movie. If the characters are derivative, this is nothing compared to the film's plot, which steals from the same two movies it takes it's character from, as well as a hundred or so others. If I were to describe the story as "One man mission to save the President's daughter" + "Die Hard in a space prison", I don't think it would be too taxing for genre fans to connect the dots! Lockout has a number of serious issues that push it into the realms of bad movie territory, the screenplay is oddly structured and horrendously cliched, it has some terrible cgi (seriously, what is with that bike/car chase at the beginning? ), the action is horribly edited, the supporting cast is full of cardboard characters and it fails completely to make anything of it's setting. 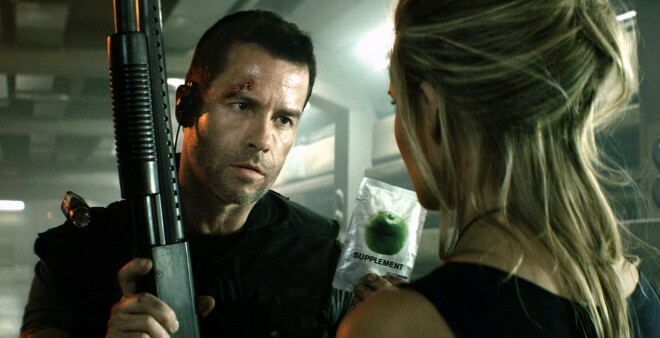 Having said all that I still had a pretty good time, all thanks to Guy Pearce, who breathes life into the proceedings with real vigour and gives everything to the part. Yes, he's overwritten with almost every line being a wisecrack, but Pearce sells it and is the saving grace of the whole project (Unlike Maggie!) and I wouldn't mind seeing Snow return at some point in the near future. 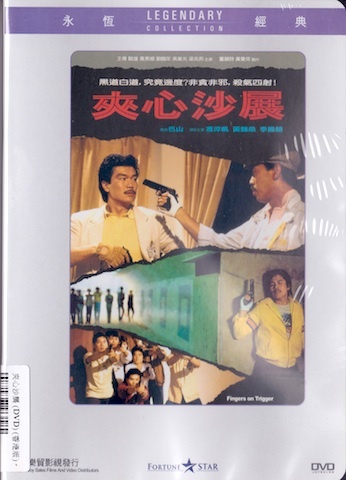 New wave director Alex Cheung's second feature after his excellent debut Cops and Robbers, 1981's Man On The Brink further examines the inherent links between cop and criminal, taking it a stage further this time as the the two become entwined as one. 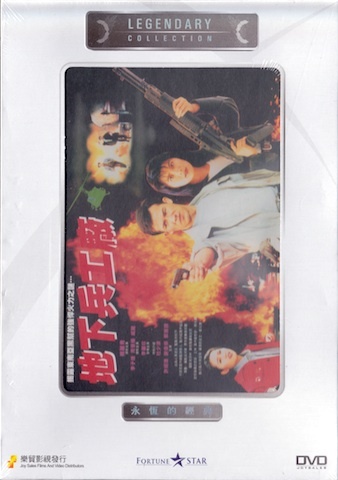 The film stars Eddie Chan as Ah Chiu, a cop given a special assignment to infiltrate a triad gang, to get to know the inner workings of the gang, and to become one of them in order to take them down from the inside. Initially enjoying the job, Ah Chiu soon realises the lifestyle is taking it's toll, not only on his own life but the lives of those close to him. With only fellow undercover cop Ah Tai (Kam Hing Yin) to confide in, the pressure mounts on Chiu to unbearable levels, as he teeters, well on the brink of course! 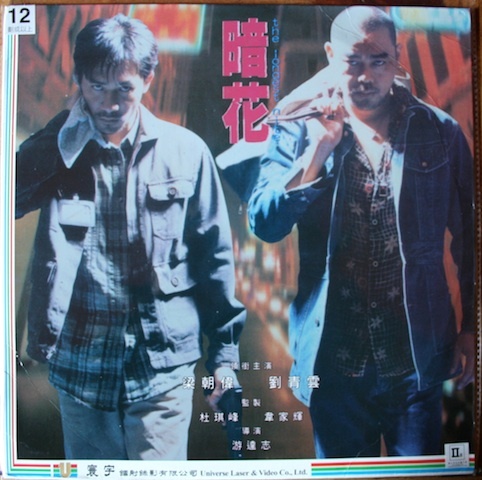 Cheung's film is much more of a serious, gritty drama examining the psychological effects of the undercover's life rather than the expected action flick. Man On the Brink does deliver short bursts of violent action, which serve to enhance the the pressure cooker atmosphere, rather than them feeling like they are there for the sake of it. These sequences are suitably chaotic and desperate, giving them a distinctly realistic feel. 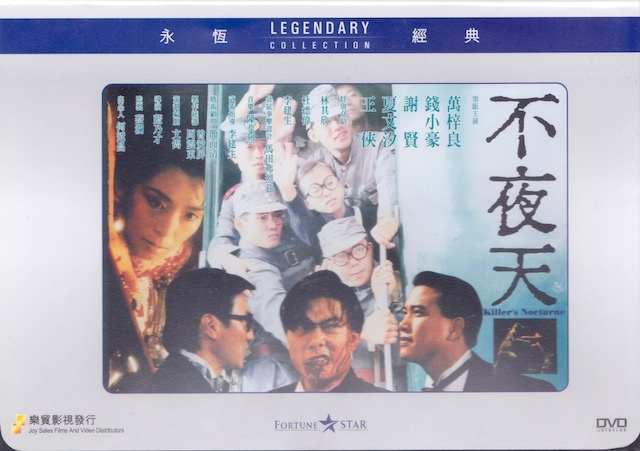 One of, if not the earliest example of the undercover film in Hong Kong cinema and as such, not only is Cheung's film superb in it's own right, but highly influential in this popular sub-genre of the crime film. In addition to directing, Alex Cheung also wrote and shot the film, and it was clearly a labour of love for him and aside from a couple of moments of unnecessary humour, he does an excellent job across all disciplines, even managing to fit in a little biting social commentary. For a 1981 film, it holds up remarkably well with only a heavy handed music montage dating the film, otherwise it still feels fresh, and considering the number of imitators the film inspired this is truly remarkable. 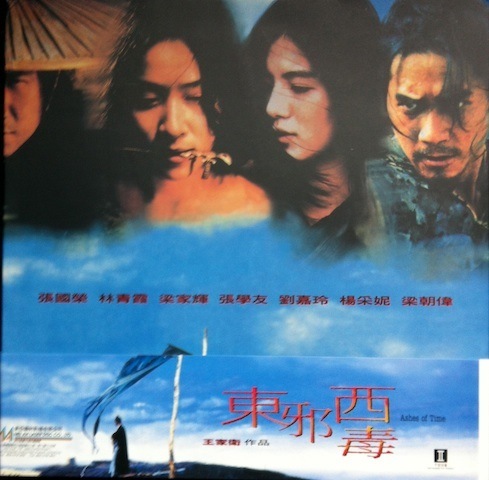 In a movie full of strengths, Eddie Chan's performance is one of it's greatest and he's never anything less than believable, giving the film a solid emotional core and making you completely empathise with him as he buckles under the intense strain of the situations he finds himself in. The sense of dread is palpable as Cheung expertly ratchets up the nerve shredding tension as the story moves towards it's conclusion. 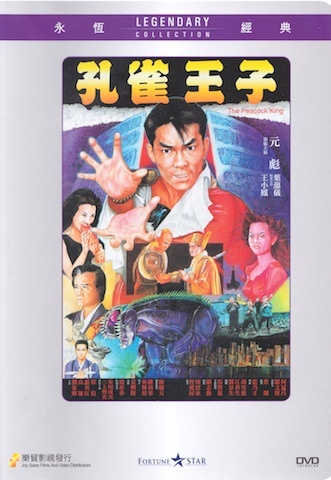 Unfortunately Man On The Brink is another classic Hong Kong film unavailable on dvd, and as a result difficult to see, I would urge you to track it down however you can, trust me it's worth it! 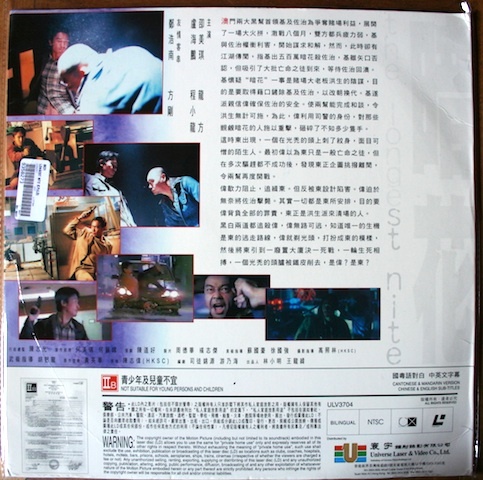 A quick post as a kind of companion piece to Jack's blog post yesterday regarding the UK video label Made In Hong Kong. 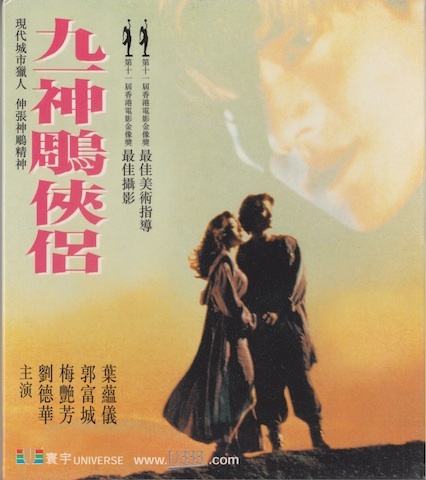 As Jack says, M.I.H.K were really the first label to take Hong Kong cinema seriously, certainly in the UK at least. They put out excellent widescreen tapes of some H.K classics but also took the chance to expand their collection and introduce fans of John Woo and Tsui Hark to other less celebrated but no less worthy films and filmmakers. Where their competitor Eastern Heroes was somewhat of a ramshackle operation, M.I.H.K came across as a professional company who respected their product and the fans who purchased it. As well as putting out movies on VHS, they also pushed a few of their movies with brief theatrical releases and even moved into the niche market of laserdisc, a pretty ballsy move as that market never really took off in the UK. 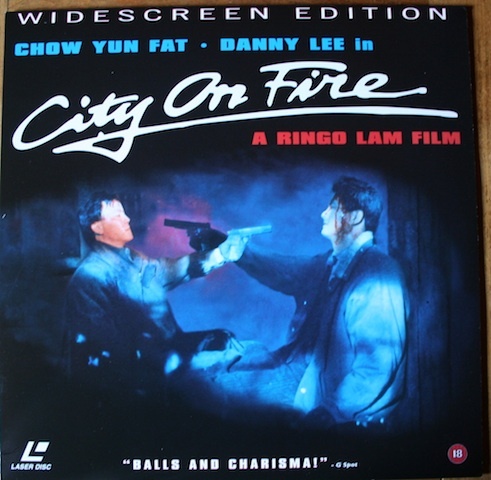 Here is their laserdisc release of Ringo Lam's City On Fire. Got to get myself a mink disguisse! 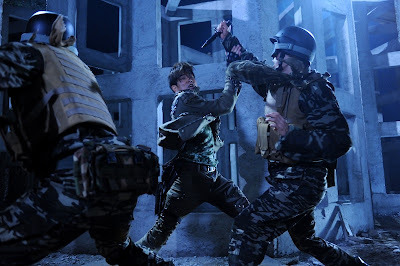 After 1992's Naked Killer and 2002's Naked Weapon, Wong Jing returns to the "Naked" series in 2012 as the writer and producer of Naked Soldier. Directed by Marco Mak and starring Jennifer Tse, Sammo Hung and Anthony Wong, the long in gestation project sees it's release this week. 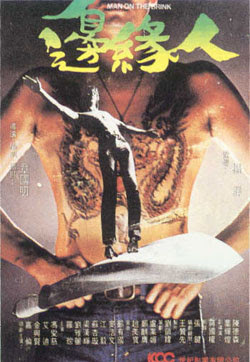 Having loved Naked Killer and despised Naked Weapon, from the trailer it's hard to know what to make of this one. While I don't think anyone is expecting a cinematic masterpiece, on the one hand it looks like it could be trashy fun and on the other it could be just trash. The footage and stills indicate plenty of effort has gone into the production side of things and with Corey Yuen on action duties who knows? The big question isn't if the film will be any good or not, it's will the film live up to it's title and feature any actual naked soldiers? All will be revealed (or not) on the 7th of July.